Printmaker and artist Martin Blundell, whose son, photographer Simon Blundell, is profiled in February’s edition of 15 Bytes, studied at the U under Robert Kleinschmidt during the mid-70s and is well known for his mixed-media drawings and paintings. He and two partners just sold SDI, a large Salt Lake City screen-printing business, which will leave him time to get back to artistic pursuits. He tells us, “I love Ed Maryon watercolor paintings.” Maryon’s watercolors, Blundell recalls, were most interesting and “different than the watercolor paintings I was used to seeing. The paintings combined the gradients and texture of the medium, with Ed’s liberal use of design.” Blundell says he remembers “a painting of a shed, trees and scattered objects after a snowstorm. 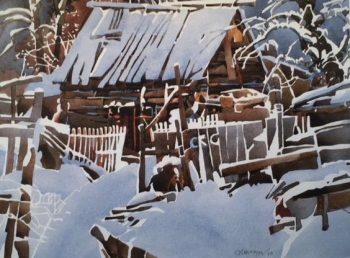 Ed used the white paper to represent the snow highlighting the forms under a white blanket.” The work was “Snow Barn” from 1980. 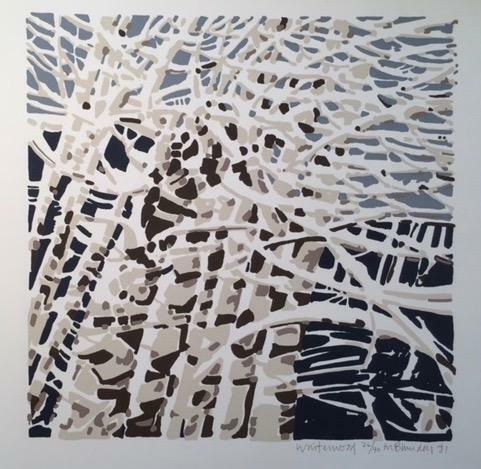 “I made a screen print in a similar way, using the white unprinted paper to establish the snow hanging heavy on the branches of aspen trees, against a dark landscape background and blue sky,” says Blundell, a tribute Maryon would surely have appreciated. A watercolorist of Cubist tendencies whose works “are elegies to structure and grace” was how 15 Bytes Editor Shawn Rossiter described Edward D. Maryon (1931-2005) in an article written just before the artist died of Parkinson’s disease. “Winter World” by Martin Blundell, 1971. During his 34 years with the University of Utah (where he earned his BFA in 1952 and MFA in 1956), Maryon worked as a professor; was named chair of the art department in 1962; served as acting dean and dean of the College of Fine Arts. During his time as dean, the college added a new Art and Architecture center and a new Museum of Fine Arts, as well as professional ballet and modern dance. In 1970, Maryon also began teaching a summer art workshop on the Monterey Peninsula that lasted more than 30 years. He credited his undergraduate instructors, LeConte Stewart, Alvin Gittins, Arnold Friberg, and George Dibble as the most influential in his life.